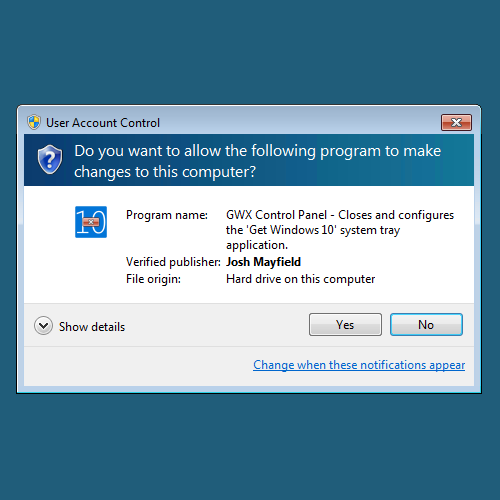 GWX Control Panel is a free program that you can use to protect your Windows 7 or Windows 8-based computer from unwanted Windows 10 notifications and upgrades- and version 1.7 of the program introduces a number of features and usability improvements that give you even more control over your computing environment. This user guide covers all features of the current version of the program and highlights some of the new capabilities and improvements in version 1.7. Head to the download page to pick up the latest version of the program. UPDATE (January 24, 2016): This user guide might not be as up-to-date as the original GWX Control Panel announcement page. I apologize for the confusion over having different "user guide" posts, but you wouldn't believe how archaic and brittle this blogging platform is. Version 1.7 was such a big update that it was easier for me to just write a new user guide for it from scratch and then import it into the main post once I was finished. Anyway, please check the announcement page for the latest information. There isn't anything in this post that's not covered there. The new Delete Windows 10 Programs feature gives you the ability to delete some hard-to-remove Windows 10-related applications with just a couple of mouse clicks. 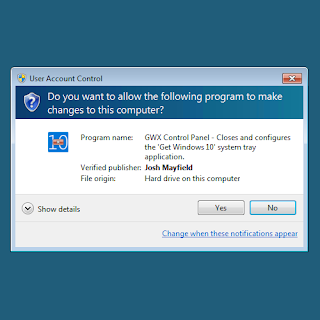 GWX Control Panel now monitors your Windows Update preferences and alerts you if your settings switch to "install updates automatically" mode from one of the other settings that give you more control over your updates. 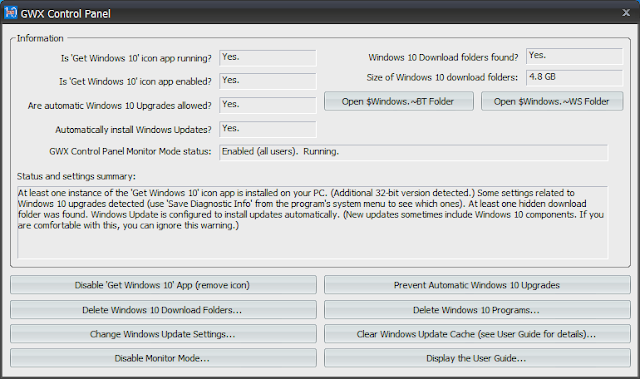 Also, you can now check and change your Windows Update preferences with the new Change Windows Update Settings feature. The program no longer prompts you for restarts after you perform certain operations, due to improved handling of certain system settings. 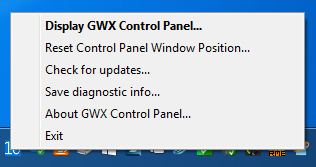 Much more detailed "Save diagnostic info" reports tell you exactly which settings GWX Control Panel detected on your system. 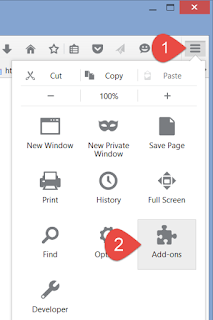 Much better user experience for computers with multiple Windows profiles and Standard/Child user accounts. There's a lot more! For a complete breakdown of all updates and features in version 1.7, check out the GWX Control Panel Release Notes section of the announcement page. The Prevent Automatic Windows 10 Upgrades feature checks for system settings that leave you vulnerable to unwanted Windows 10 upgrades and gives you the ability to fix them. The Prevent Automatic Windows 10 Upgrades feature can even rescue your PC from impending Windows 10 installs that display the "It's almost time for your upgrade" window. The program alerts you if your Windows Update settings change from one of the safer "download only" or "check only" options to "automatically install" behind your back and gives you the chance to fix it with the Change Windows Update Settings feature. 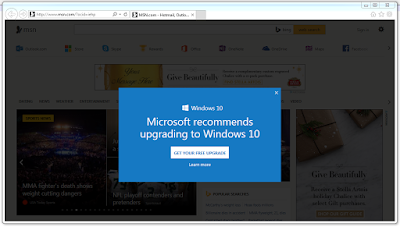 GWX Control Panel is not yet able to inhibit the "Microsoft recommends upgrading to Windows 10" banner ads in Internet Explorer, but this ability might appear in a future release. 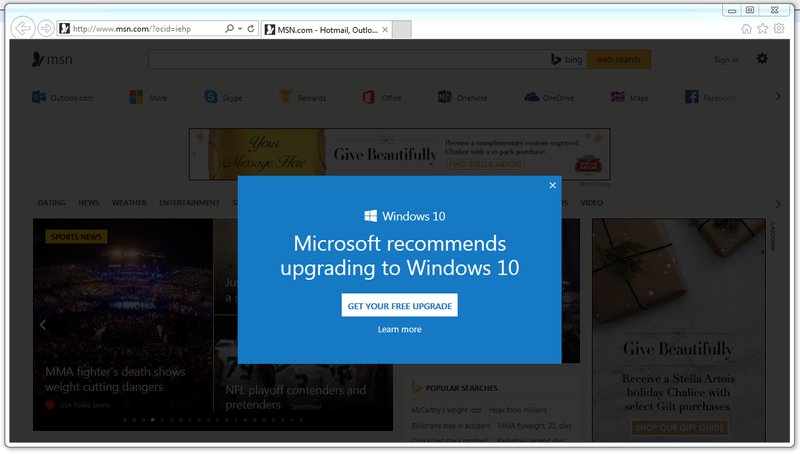 This is another example of the annoying Internet Explorer "Microsoft recommends upgrading to Windows 10" ads that GWX Control Panel does not (yet) fix. Investigation on how to stop this behavior is ongoing. The main GWX Control Panel window in version 1.7. Enable/Disable 'Get Windows 10' App: This enables or disables Microsoft's Get Windows 10 icon app, either removing or restoring the icon in your notification area, as desired. 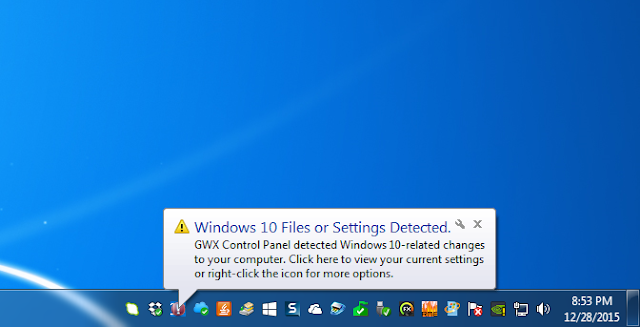 This button is only available if GWX Control Panel detects the app on your PC. 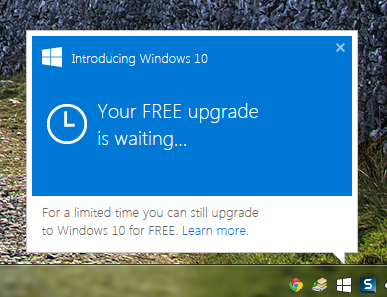 Prevent/Allow Automatic Windows 10 Upgrades: This changes a number of settings that determine whether Microsoft is able to upgrade your PC to Windows 10 or change the behavior of your Windows Update control panel to deliver Windows 10 advertisements and updates. 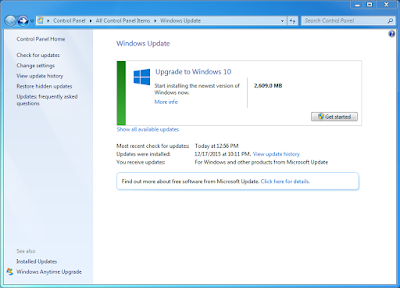 This does NOT disable Windows Update and does not block or hide any Windows Update patches. Delete Windows 10 Download Folders: If any of the hidden Windows 10 installer folders are detected on your computer, you can use this button to delete those files and free up storage space. This button is not available if no download folders are detected. Note that this procedure can take some time (once it starts actually deleting files, you should see the "Size of Windows 10 download folders" field report gradually decreasing sizes. If you have trouble deleting all of the files, you can use the "Save diagnostic info" option in the program's system menu to see if there were any telling error messages. 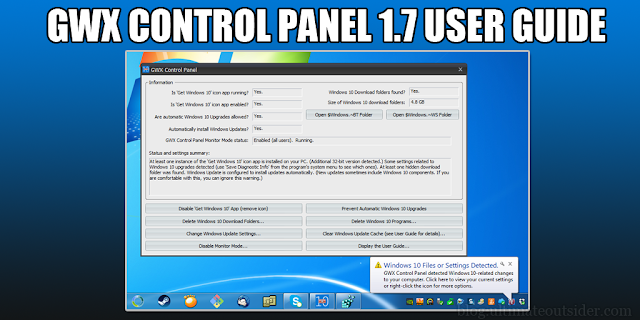 Change Windows Update Settings: This new button in version 1.7 opens a dialog box where you can change how Windows update behaves. These are some of the same options available in the "Change settings" screen of the Windows Update control panel. 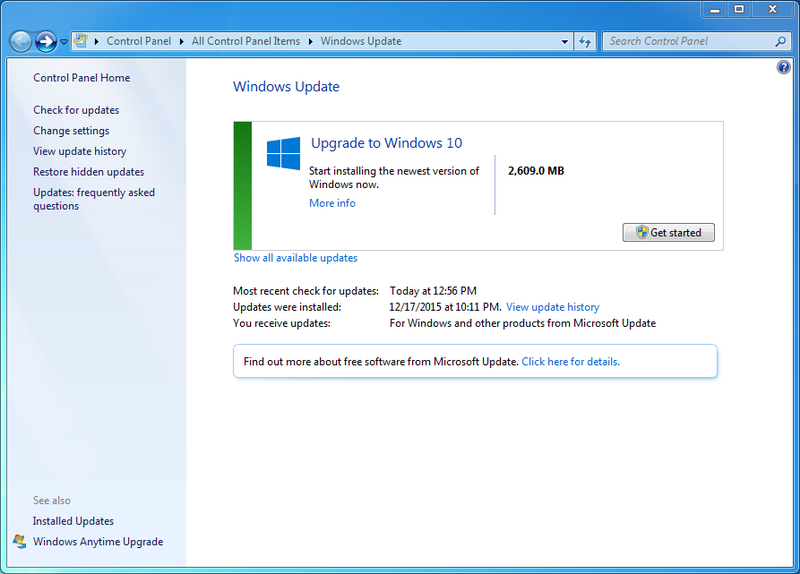 For the best balance of security and protection from Windows 10, it's recommended that you choose one of the options that lets you choose which updates you wish to install, rather than installing all updates automatically or disabling updates entirely. Clear Windows Update Cache: While not directly related to Windows 10, this step is sometimes necessary to remove some lingering Windows 10 notifications from your Windows Update control panel after using the "Prevent Automatic Windows 10 Upgrades" feature. 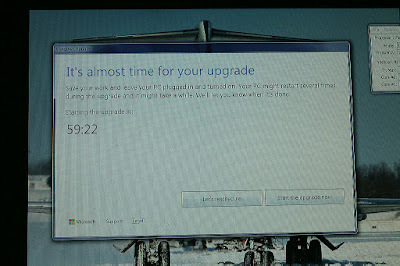 While this feature isn't harmful, it really isn't necessary in most cases, and it does result in some one-time changes in Windows Update that some users might find annoying. GWX Control Panel lists all known one-time effects when you choose this option and gives you a chance to decide whether to proceed before clearing your update cache. 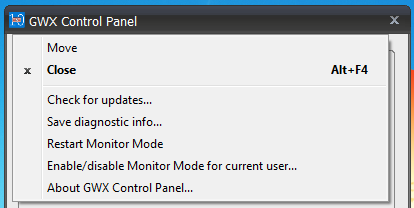 Enable/Disable Monitor Mode: Use this button to manage the Monitor Mode feature of GWX Control Panel. Monitor Mode places an icon in your notification area that alerts you if it detects any changes to your PC that might leave you vulnerable to Windows 10. Please see the "Using Monitor Mode" section below for more info. 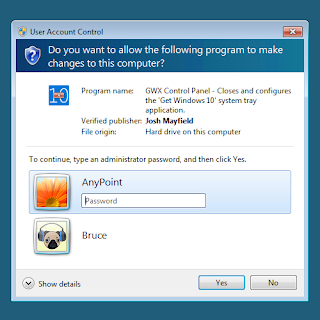 Display the User Guide: This launches your default browser to the GWX Control Panel user guide. If you ever decide to send a PayPal donation (see the "Support GWX Control Panel" section above), you can use the "add special instructions to recipient" field to include a personal note. I read and respond to all of those. Last week Amazon began rolling out a replacement to their Amazon 1Button App browser add-on called Amazon Assistant. Also beginning some time last week, any time I clicked a link inside an email on my Gmail account, Firefox would just open up a blank page instead of navigating to the link I had clicked. Coincidence??? I went through all the ordinary steps in trying to solve the problem, and none of them worked. I tried clearing Cached Web Content in the Firefox Advanced > Network options. I tried removing all Google cookies in Firefox's Privacy options. I tried switching from Auto-detect to No proxy in Firefox's Advanced > Network > Settings options. None of this made a difference. 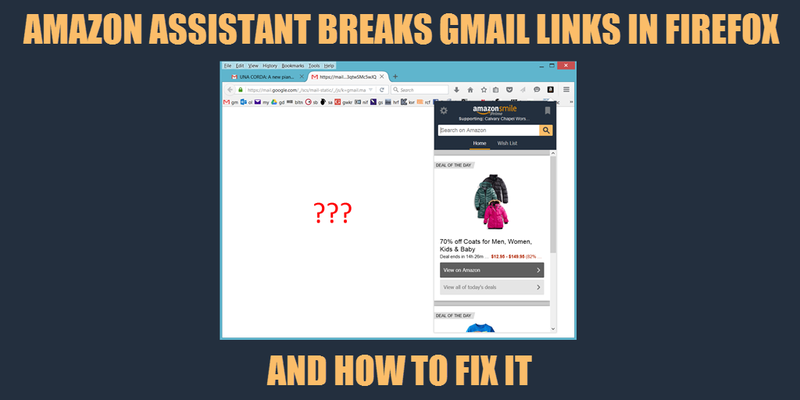 Ah, it was the Amazon Assistant add on that was breaking my gmail links, for the record. 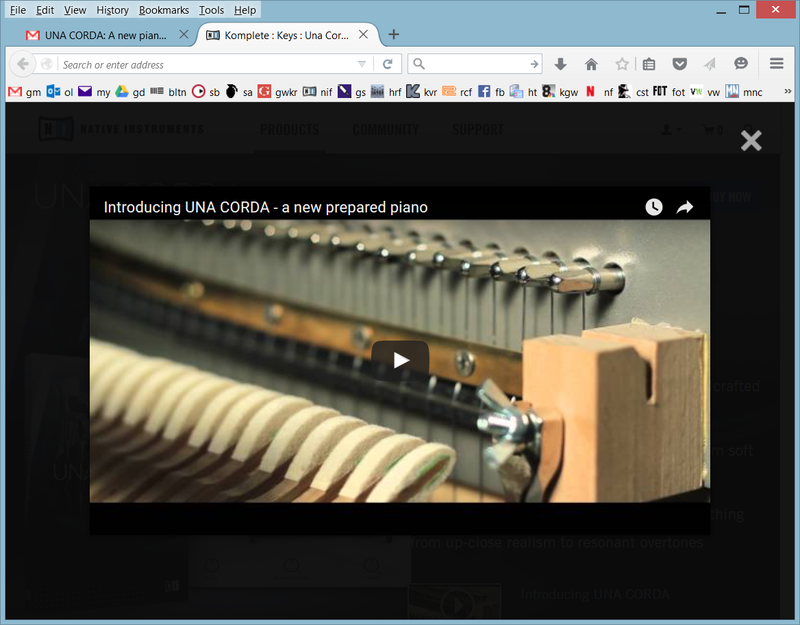 Click the hamburger menu in the upper-right of your Firefox browser window, and then click Add-ons. On the Extensions tab of the Add-ons Manager, select Amazon Assistant for Firefox and then click Disable (or Remove). The add-on's state will change accordingly. Close the Add-ons Manager and return to your Gmail account. Locate an email that contains a link you had previously tried to click and see if it works now. My thanks to Uncanny Kate Kirby on Twitter for helping solve this mystery! 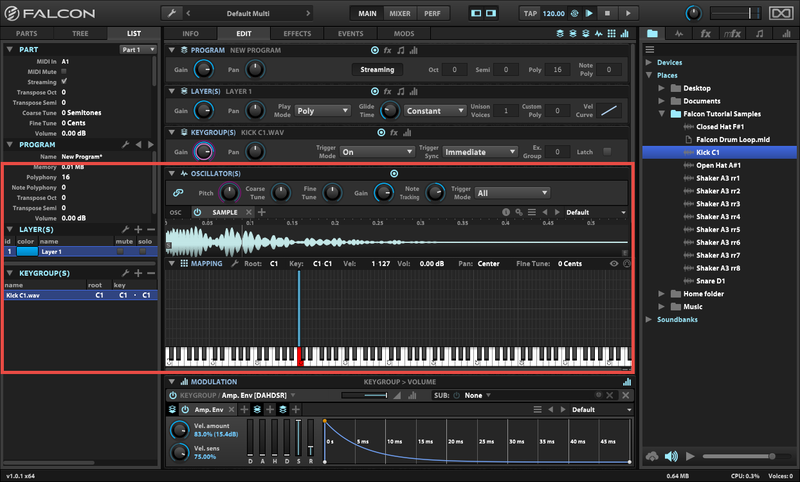 UVI Falcon has taken the soft synth world by storm since its release, but there's not a whole lot of information out there yet on how to do certain things with this powerful instrument. Using layers in Falcon to send different drum sounds to separate audio output channels that you can mix and process individually in your DAW. Setting up an exclusive group (or "choke group") to simulate real hi-hat behavior. Using Falcon's "custom drop" feature to import multiple samples into a single keygroup. Using the round robin trigger mode to add variety to individual percussion sounds. 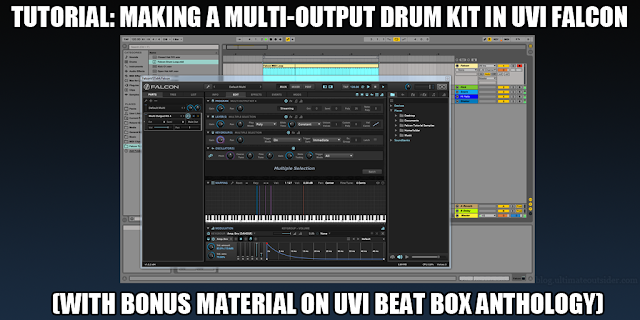 And finally, we'll see how to apply some of this knowledge to modifying kits in UVI's excellent Beat Box Anthology collection of classic drum machine samples. I produced a YouTube companion video that covers everything in this written tutorial except for Cubase configuration. If you prefer written tutorials, read on! Open up a new DAW project and create an instance of Falcon. Make sure your left and right panels are both visible. You toggle the panels on or off using the Show/Hide Panel buttons at the top of the Falcon window. 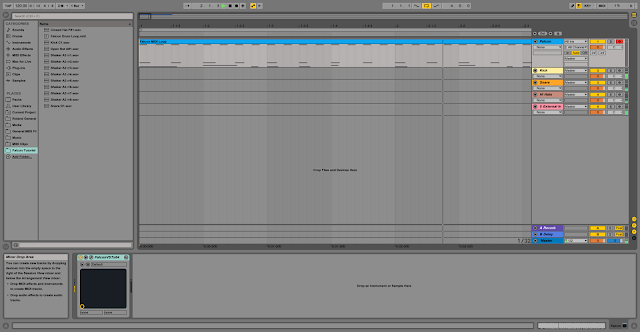 Also make sure all the sections of the Edit tab (Program, Layer, Keygroup, Oscillator, Mapping, etc.) are visible by enabling their respective icons. Falcon automatically creates a new, empty program (patch) when you start a new instance. Download the Falcon tutorial sample pack from the Ultimate Outsider Software page. Extract the samples to a local folder and then browse to them in the file browser tab of Falcon. I've added my copy of the folder to the Favorite Places section of the browser. Click the wrench icon near the top of the Falcon window to open Falcon Preferences. 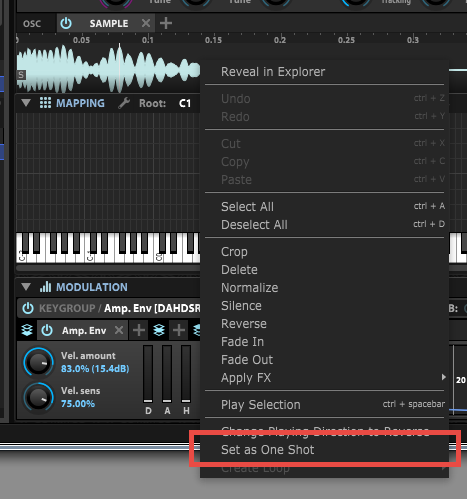 On the General tab, enable the One Shot option next to Sample drag'n'drop mode. This will ensure that our drum samples automatically play all the way through when triggered. 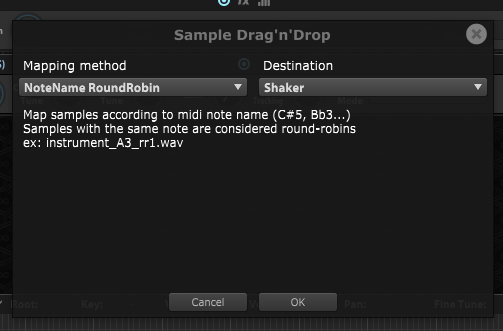 You'll notice that each of the samples includes the intended MIDI note value in its name. Drag the Kick C1 sample to the C1 key on Falcon's virtual keyboard. 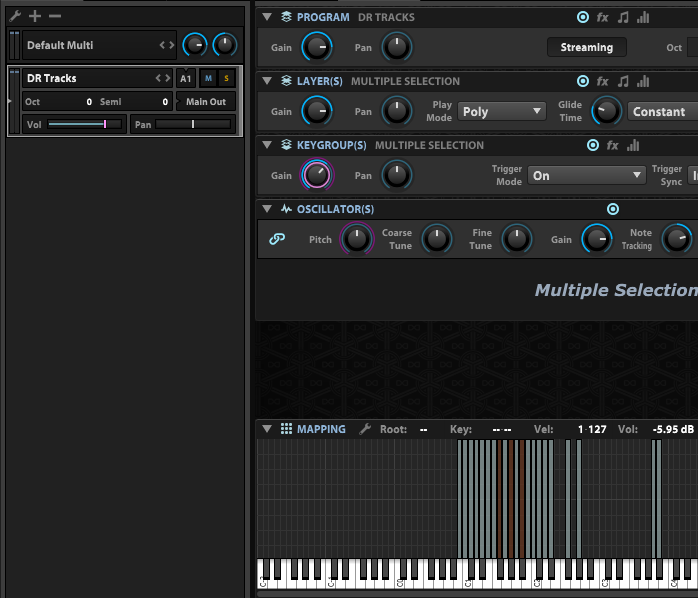 This creates a new layer ("Layer 1"), a new keygroup ("Kick C1.wav"), and a new oscillator that contains your sample. 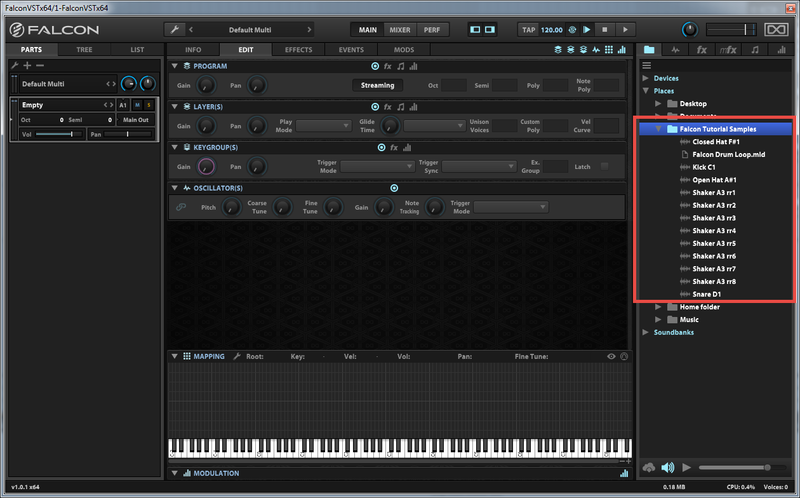 You should be able to trigger the sample with your MIDI controller or by clicking its note on the virtual keyboard. 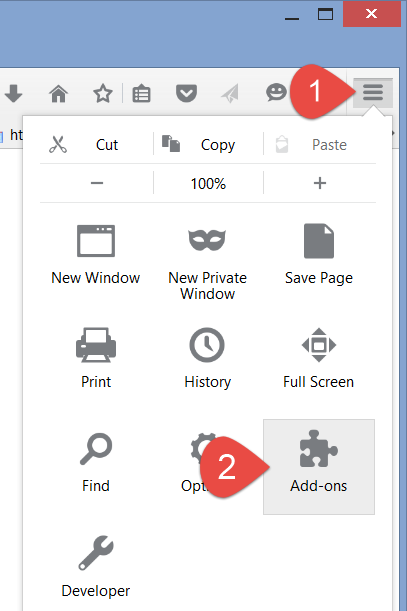 If you select the List pane in the left tab of Falcon, you can see the new layer and keygroup. Tip: The lower you click on the virtual keyboard, the higher the velocity of the auditioned sound. This velocity sensitivity happens by default, and is the result of velocity modulation to the amp envelope, as shown in the above screenshot (bottom of the window). If you disable or delete the Amp. Env modulator, you will disable velocity sensitivity for this keygroup. Note: If you didn't set your drag'n'drop preferences to One Shot in step 3, you can apply one-shot mode to an individual sample oscillator by right-clicking inside the waveform and choosing Set as One Shot on the shortcut menu. Click the + sign in the Layer(s) row to add a new layer. Double click the new layer's name and rename it to Snare. Leave this layer selected (so that it's highlighted.) 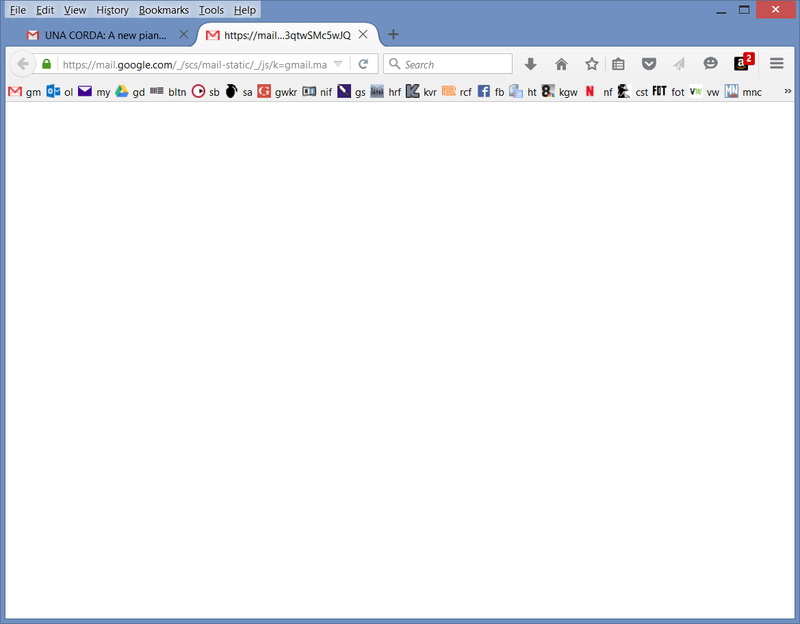 The Keygroup(s) pane should appear empty. Drag the Snare D1 sample from the file browser to the D1 key of the virtual keyboard. 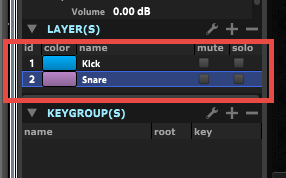 In the List tab, click + in the Layer(s) row to add another layer, and rename the new layer to Hi Hats. 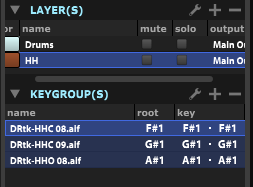 Making sure that only the Hi Hats layer is selected, drag the Closed Hat F#1 and Open Hat A#1 samples to their respective places on the virtual keyboard. 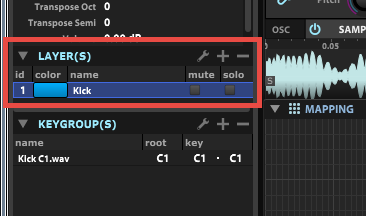 Your single Hi Hats layer should now have two keygroups, each containing a single sample oscillator. In order to make the hi hats behave more like real cymbals, we're going to put them in an "exclusive group," where one hi hat sample cuts the other one short when playing. 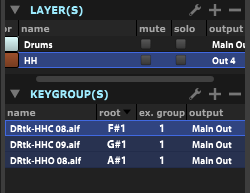 With the Hi Hats layer selected, scroll the Keygroup(s) view all the way over to the right so you can see the ex. group column. Note: If you can't find ex. group, right-click any of the column headers in the Keygroup(s) pane and make sure to check ex. group in the list. For each of the keygroups under Hi Hats, set the ex. group field to 1. (You can change the values by dragging your left mouse up or down on the fields, or by double-clicking them and entering a new value.) This puts the hi hats into the same exclusive group. Now when you play the two hi hat samples very quickly, triggering one of them will cut the other one short. Add a new layer in the List tab and name it Shaker. Make sure that only the Shaker layer is selected, and then SHIFT-select all of the Shaker A3 samples in the file browser. Notice how all of these samples end with something like "rr1?" Falcon recognizes this as an indication that these are intended for a round-robin keygroup. Hold down ALT on Windows (or OPTION on Mac) while dragging the shaker samples to the A3 key. This brings up the Sample Drag'n'Drop dialog. 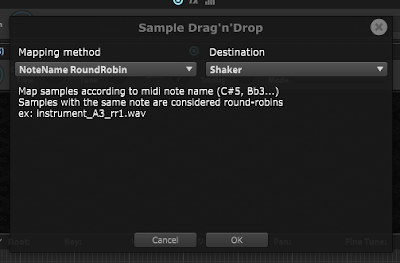 Select NoteName RoundRobin under Mapping method and make sure Destination points to your Shaker layer, and then click OK.
You should now find that your Shaker layer has a single keygroup that contains all eight shaker samples. Each time you press A3 on your keyboard you will hear a slightly different shaker sample. At this point we have a basic drum kit that sends all audio to the plugin's "Main Out" bus. Save your work now by clicking the wrench icon and selecting Save Program and Samples. In addition to saving your program as a UVIP file, this command is supposed to create a folder in the same directory containing all samples used in that program. Note: On version 1.0.1 of Falcon, Save Program and Samples doesn't appear to actually save the samples (not on my Windows DAW PC anyway). I have found that the Save Program and Samples as command, however, does correctly export the samples. Something to keep an eye on. Before we start setting up our Falcon kit to use multiple outputs, we should make sure our DAW is ready to receive audio from the plugin's various outputs. The easiest way to do this in Ableton Live is to make use of the External Instrument device (only available in the Standard and Suite versions of Live). The MIDI track hosting our Falcon instance receives audio from Falcon's "Main Out" master stereo output. When you're working with multiple outputs, it's best not to assign any parts to Main Out, since that bus is also shared by Falcon's four Aux buses. 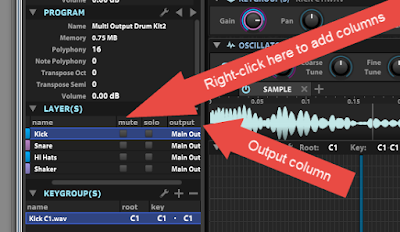 What this means for our DAW setup is that we'll need four additional MIDI tracks to receive audio from the four layers in our drum kit. 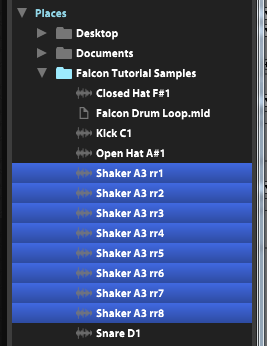 I've named my additional tracks Kick, Snare, Hi Hats, and Shaker. Drag an External Instrument device to the Kick track. Point its MIDI To to the Falcon track, channel 1. Under Audio From, select the Falcon 2 output. 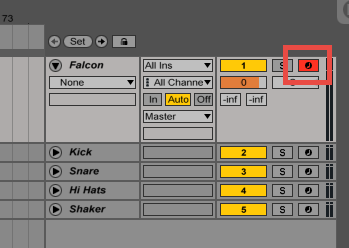 Repeat this for the Snare, Hi Hats, and Shaker tracks, only set their Audio From entries to Falcon 3, Falcon 4, and Falcon 5, respectively. 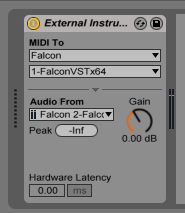 Select the Falcon track and make sure that it's armed for MIDI input. 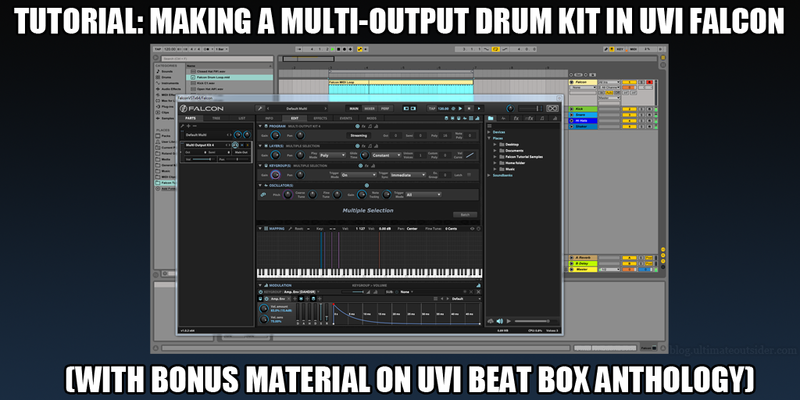 Since all the screenshots up to this point use Ableton Live, we'll take the Cubase setup from the top. I'm going to use the "Rack Instruments" approach (versus the "Track Instruments" approach), because you can use the rack method in all versions of Cubase from 5.0 on. These steps will definitely work in the Pro and Artist editions of Cubase, but probably apply to the limited editions as well. In a Cubase project, go to Devices > VST Instruments an add Rack Instrument instance of Falcon. When Cubase asks if you want to create a MIDI track assigned to Falcon, click Create. Back in the VST Instruments window, click the Activate Outputs icon on the Falcon instance. 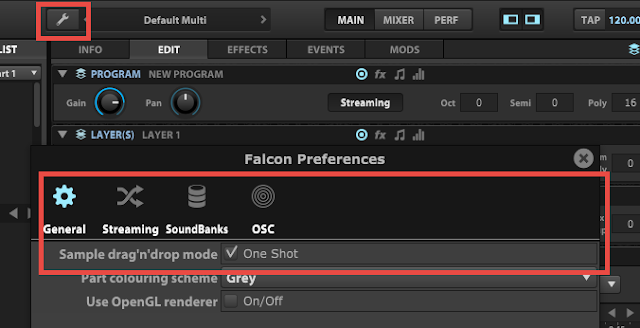 In the menu that appears, make sure to enable outputs Falcon 1-Falcon 5. 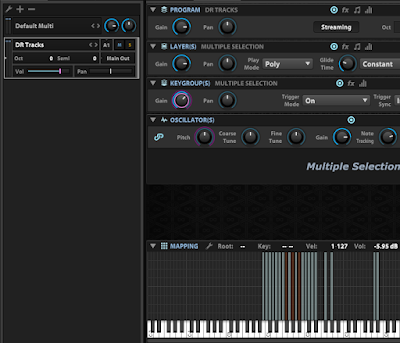 The plugin's Main Out goes to Falcon 1, and the other four outputs are for the individual drum layers. 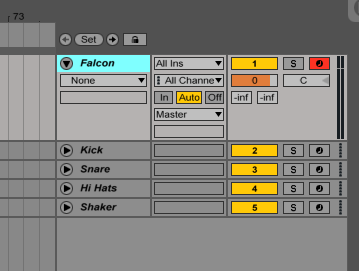 If you expand the Falcon folder under VST Instruments in your arrangement view you should now see five separate VST channels, one for each output pair enabled on the plugin. You can set up inserts and sends on these channels just like regular audio tracks. In my example, I renamed the VST channels to represent which drum parts they would receive. 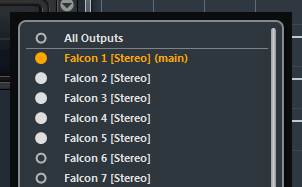 I also renamed the MIDI track that's routed to the Falcon instance. The Cubase project, after renaming the VST channels and MIDI track and importing a MIDI loop. Back in Falcon, locate the output column in the Layer(s) tab of the left pane (you may have to scroll right to see it). This column is actually hidden by default, so if you cannot find it, right-click one of the column headers in the Layer(s) list and then click output on the shortcut menu. Now when you play the appropriate notes on your MIDI controller you should see audio coming in on separate tracks in your DAW. Use Save Program and Samples as to save the multi-output version of your kit if you like. The sample pack I put together for this tutorial includes a MIDI drum loop that you can import in your DAW to test the kit out. 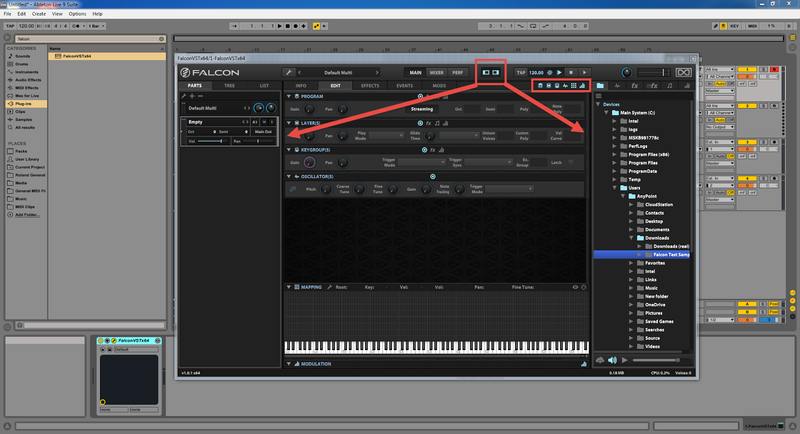 Drag the clip onto the MIDI track where your Falcon plugin instance is hosted. You can now apply your own effects and EQ to each drum part in your Falcon drum kit! At default track volume, the shaker layer is pretty loud in relation to the rest of the kit. If you'd like to adjust the volume of a specific layer, go back into Falcon and locate the volume column in the Layer(s) pane of the List view. You might have to scroll to see it. Also, the volume column is hidden by default, so right-click one of the other column headers and then click volume on the pop-up menu if it's not currently shown. Make sure that only the layer (or layers) you wish to adjust is selected and then adjust the volume field for that layer by dragging down or up. UVI's Beat Box Anthology is a great collection of kits and samples of dozens of classic drum machines. All of the kits in the collection are set up to send all sounds to the instrument's Main Out. Users of the free UVI Workstation are stuck with this limitation, but Falcon gives you the ability to tweak these kits to suit your needs. 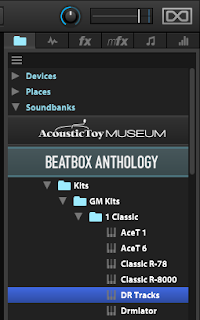 Beat Box Anthology is included in UVI's Vintage Vault bundle, and the following steps assume you have both Falcon and Beat Box Anthology installed. Double-click one of the kits to load it into the currently selected Falcon part. I've selected the DR Tracks kit, which is based on the Sequential Circuits Drumtraks unit from 1984. On the List tab of the left panel we can see that this kit contains two layers. One layer is for the hi hat choke group, while all other sounds in the kit reside on the other. We can assign the hi hats to their own output the same way we did in Part 6 earlier. First, make sure that only the HH layer is selected in the List view, and then scroll over to locate the output column in the Layer(s) section. If you don't see it, right-click one of the column headers and then click output in the shortcut menu to add it to the Layer(s) view. Change the output setting for this layer to Out 4 (to match the assignments we used in part 6). For the rest of the drum sounds, we'll need to edit the keygroups assigned to individual samples in the kit. 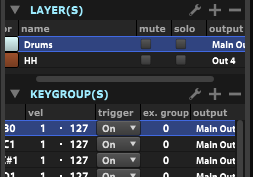 First, make sure that only the Drums layer is selected, and then ensure that you can see the output column in the Keygroup(s) view. Like with the Layer(s) view, the output column is hidden by default. Next set up your DAW to accept multiple plugin outputs just like we did in section 5 above, and don't forget to arm the Falcon track to intercept your MIDI if you're planning to test your setup out with your keyboard controller. If you have my Falcon tutorial sample pack, drag the Falcon Drum Loop MIDI clip onto your Falcon plugin track and loop it. Important: Don't forget to save the modified versions of your kits! Click the wrench icon and use Save Program as or Save Program and Samples as to back up your work. Unlike most of the UVI libraries, Beat Box Anthology includes individual drum samples that you can access in the file browser to create or modify your own kits. 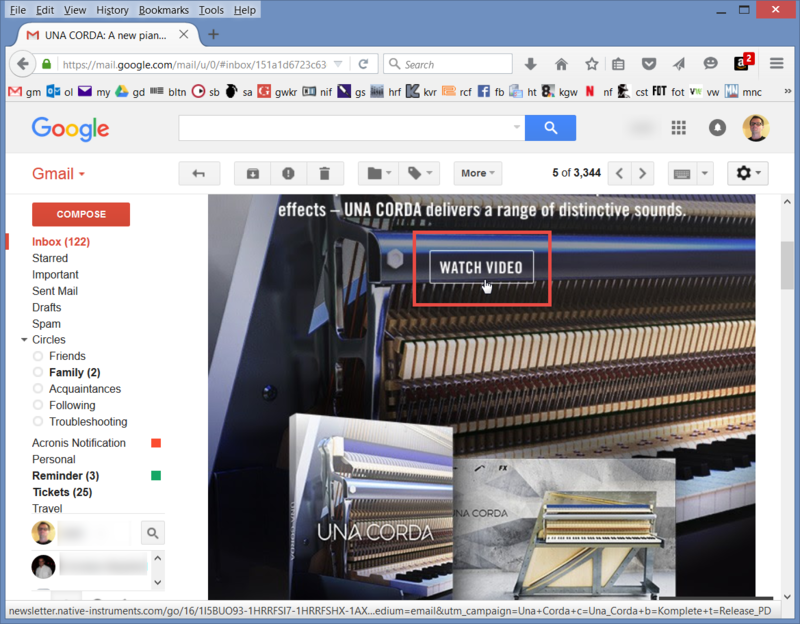 If you have the auto preview button activated, you can audition the samples while you browse by selecting them with your mouse or the arrow keys. You can drag these samples from the file browser right into your kit. Well, that's it for now. Check out the Ultimate Outsider YouTube channel or the blog at UltimateOutsider.com for more production tips. Enjoy!